On 4 November 2010, a flight from Singapore to Sydney came within a knife edge of being one of the world's worst air disasters. Shortly after leaving Changi Airport, an explosion shattered Engine 2 of Qantas flight QF32 - an Airbus A380, the largest and most advanced passenger plane ever built. Hundreds of pieces of shrapnel ripped through the wing and fuselage, creating chaos as vital flight systems and back-ups were destroyed or degraded.In other hands, the plane might have been lost with all 469 people on board, but a supremely experienced flight crew, led by Captain Richard Champion de Crespigny, managed to land the crippled aircraft and safely disembark the passengers after hours of nerve-racking effort.Tracing Richard's life and career up until that fateful flight, QF32 shows exactly what goes into the making of a top-level airline pilot, and the extraordinary skills and training needed to keep us safe in the air. 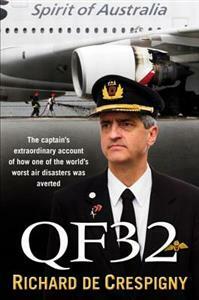 Fascinating in its detail and vividly compelling in its narrative, QF32 is the riveting, blow-by-blow story of just what happens when things go badly wrong in the air, told by the captain himself. Melbourne born and educated Richard De Crespigny got his first taste of a future flying career as a fourteen year old when his father took his on a tour of the RAAD Academy at Point Cook in Victoria.In 1975, aged seventeen, he joined the RAAF. One year later, he started flying. During his eleven years with the RAAF, he was seconded as Aide-de-Camp to two Australian Governors-General - Sir Zelman Cowen and Sir Ninian Stephen. Richard remained with the RAAF until 1986 when he joined Qantas.